LAKE PLACID, N.Y. — To mark the 35-year anniversary of the 1980 Olympic “Miracle on Ice,” Olympic gold medalists, Mike Eruzione, captain, and Jim Craig, goalie, were among the living members of the U.S. 1980 U.S. Olympic hockey squad who reunited on Sunday, Feb 22, 2015 for the “Relive the Miracle” reunion at Herb Brooks Arena in Lake Placid, New York. Missing was Herb Brooks, the Hall of Fame coach who was killed in a car accident in 2003, and rugged defenseman Bob Suter, who died at age 57 in September. Source: ESPN. 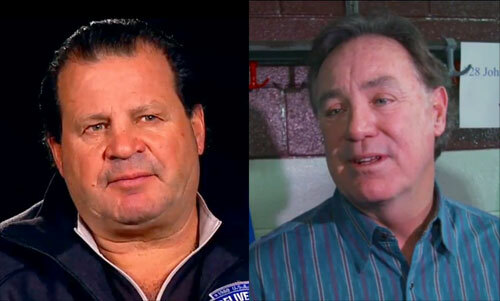 Mike Eruzione (L) and Jim Craig (R) at “Miracle on Ice” 35 year reunion Feb. 22, 2015. The “Relive the Miracle” reunion at Herb Brooks Arena attracted more than 5,000 fans for a two-hour celebration of one of the most memorable upsets in sports history. Every surviving player from the team made the trip. It was the first time the team had all been together since that memorable night.” Festivities included audio, video and still pictures, as well as a discussion of the game with the players. Suter’s jersey was raised to the rafters as a tribute. 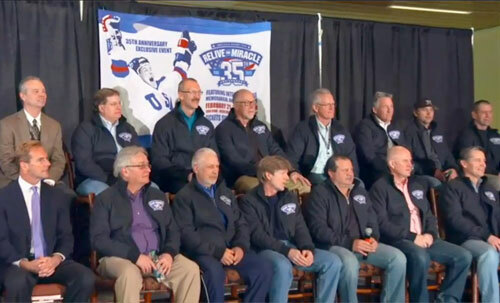 1980 U.S. Olympic hockey team members at “Miracle on Ice” 35 year reunion Feb. 22, 2015. Eruzione, who played forward, was named the captain of the 1980 Olympic hockey team, scoring the winning goal against the Soviets and helping the Americans win the gold medal against Finland. Eruzione’s winning goal against the Soviet Union has become one of the most played highlights in sports history, and was voted the greatest highlight of all time by ESPN viewers in March 2008. Today Eruzione is a popular motivational speaker. Craig stopped 36 of 39 shots on goal as the U.S. beat the Soviets, 4-3. Two days later, the U.S. defeated Finland, 4-2, in the Olympic final and captured Olympic gold. Craig went on to play professionally in the NHL, where he started for the Atlanta Flames, Boston Bruins, and Minnesota North Stars between 1980 and 1983.